Skotizo is a solo demi-boss which you can fight beneath the Catacombs of Kourend. In order to access Skotizo, you must sacrifice a complete Dark Totem, which you can assemble from three different totem pieces dropped by all monsters through the Catacombs. It can take a while to obtain all three pieces, therefore it’s not possible to ‘farm’ Skotizo in the same manner as some other solo bosses like Zulrah or Vorkath – he does, however, have some very good drops and he’s the only boss in the game to have a 100% drop rate for Clue Scrolls. The general strategy at Skotizo is just to gear for maximum DPS while finding a good balance of melee and magic defence. Skotizo will mostly use melee attacks while you are within melee distance but will sometimes use magic attacks. For this reason, you should pray melee when you’re within melee distance. Skotizo will periodically activate the Awakened Altars found in the North, South, East and West of the room. For each Altar which is ‘active’, Skotizo will have increased defence. Maxed players might be able to leave all 4 Awakened Altars active and still be able to hit through Skotizo’s defence but if you do not have 90+ stats it is recommended to allow no more than two Altars to be active at one time. When you’re running around the room to attack the Altar’s, you should switch your prayer to protect from magic to avoid taking damage from Skotizo’s magic attacks. 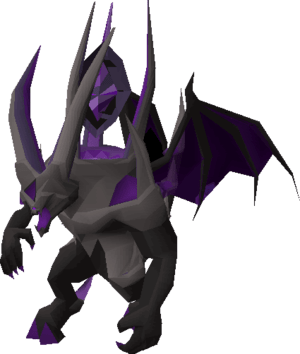 You can switch the Dragon Warhammer out for your favourite special attack weapon.